Here is an article that discusses the impact of the corporate mind-set on new product launch and its subsequent market performance. (Katrin Talke. 2010; Journal of Product Innovation Management). The article divides corporate mindsets into three types: analytical, risk-taking, and aggressive posture. Also, the product launch is boiled down to three decisions: Set launch objectives, Select target markets and position the product in the new market.Not sure how there are orthogonal or independent of each other, but lets play along for a minute. A research model with mediating effects is proposed, where the corporate mind-set determines the launch strategy decisions, which in turn impact market performance. The model is tested with data on 113 industrial new products launched in business-to-business markets in Germany using a multiple informant approach. It is found that while an analytical posture relates to all three strategic launch decisions, risk taking and an aggressive posture have a significant impact on two, respectively one, launch strategy elements. The paper A Cross-National Comparative Study of Senior Management Policy, Marketing–Manufacturing Involvement, and Innovation Performance in the Journal of Product Innovation Management has some useful data to support many intuitive judgments. The proposed framework is contingent on the national culture of the country in which product development occurs. Structural equation modeling is used to test the framework with data from a sample of 146 U.S. marketing managers and 185 Japanese marketing managers. First takeaway is the senior managers have a huge impact on how cross-organizational collaboration works. The results suggest that a number of senior management policies are effective in promoting joint involvement between the marketing and manufacturing functions during the innovation process. Another takeaway is the cultural has a significant impact. Individual behavior / rewards worked in US when they encouraged the R&D team leader, but not in Japan. More clarity and structure worked in Japan and not in the USA. While the use of formal cross-functional integration policies was found to promote marketing–manufacturing involvement both in the United States and Japan, team leader autonomy, team rewards, and job rotation were found to promote marketing involvement in the United States but not in Japan. On the other hand, promoting marketing–manufacturing involvement via goal clarity and promotion of teamwork proved to be effective in Japan. These findings go very well with the research on how IT helps collaboration between R&D and marketing. The results have a number of implications for product development practice. Foremost among these is the finding that, despite the fundamental ideological differences separating the marketing and manufacturing functions, senior management policies can enhance the level of marketing–manufacturing involvement, and consequently can improve the likelihood of new product success. The second implication is that the effectiveness of specific senior management policies depends on national culture. Thus, managers wishing to improve the marketing–manufacturing interface should select the policies that match the culture in which the product development project is located. The article High-Performance Product Management: The Impact of Structure, Process, Competencies, and Role Definition in the Journal of Product Innovation Management is interesting for many reasons. The least of them is because it provides a very good history of research in product management. More importantly, it combines qualitative interviews with factor analysis and maximum likelihood estimation to develop and test a model for improving performance in product management. 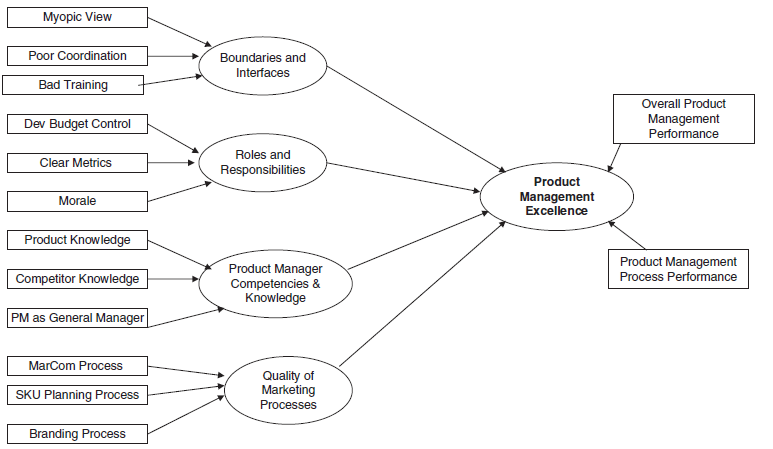 The paper identifies several key factors that potentially impact product management performance. A set of qualitative interviews is conducted to develop hypotheses related to constructs that may drive product management performance. These hypotheses are used to develop a causal model for product management performance that includes constructs related to roles and responsibilities, organization structure, and marketing processes related to product management. An empirical survey of 198 product managers from a variety of industries is conducted to test the causal model. The results of the causal model suggest that performance of a product management organization is driven by structural barriers in the organization, the quality of marketing processes, roles and responsibilities, and knowledge and competencies. The findings suggest that structural boundaries and interfaces are the biggest impediment to effective product management, followed by clarity of roles and responsibilities. The research highlights the importance of organization structure and effective human resource practices in improving product management performance. Do not expect product managers to learn on the job: Develop and provide formal training to augment knowledge / competencies / soft skills. Define Authority and Responsibilities Clearly: In many organizations, product managers have no clear authority and vaguely defined roles. This makes is difficult to deliver results. Allow Product Managers to focus on Strategy & Planning: 42% of product managers surveyed believed that they spent most of their time on tactical activities and coordination. They had no time to make strategic decisions. Firms collaborate to develop and deliver new products. These collaborations vary in terms of the similarity of the competencies that partnering firms bring to the alliance. In same-function alliances, partnering firms have similar competencies, whereas in cross-function alliances, partners have very different competencies. This is very important in co-development. If a company in consumer electronics is co-designing a new device with a PCB manufacturer, the alliance is likely to be same-functional. Good news is that alliance between firms with similar competencies seem to work well (with caveats – see below). On examining managers’ view of these alliances, we find that, on average, same-function alliances are expected to perform better than cross-function alliances, holding fixed the level of inputs. partners in cross-function alliances may invest more in their alliances than those in same-function alliances. It is also often believed that increasing the number of partnering firms is not conducive for collaborative effort. Our analysis shows that this belief is correct for same-function alliances, but not for cross-function alliances. We extend our model to consider alliances where firms have an opportunity to learn from their partners and later leverage this knowledge outside the scope of their alliance. Though such learning increases the resources committed by alliance partners in the learning phase, it decreases investment in the subsequent competition and also dampens the overall investment across the two stages. Does innovation improve with external collaboration? After surveying 251 manufacturers in Hong Kong, this study tested the relationships among information sharing, product codevelopment, product innovativeness, and performance with three control variables (i.e., company size, type of industry, and market certainty). The empirical findings show that product codevelopment with suppliers improves performance, mediated by innovation. However, the sampled firms cannot improve their product innovation by sharing information with their current customers and suppliers as well as codeveloping new products with the customers. If the adoption of supplier and customer integration is not cost free, the findings of this study may suggest firms work on particular supplier and customer integration processes (i.e., product codevelopment with suppliers) to improve their product innovation. The study also suggests that companies codevelop new products only with new customers and lead users instead of current ones for product innovation.